Supper Effect is a cross-desciplinary work taking place in the former surgery rooms of Amsterdam’s East Civic Hospital and improtantly an archetype of the building reminds of a church. 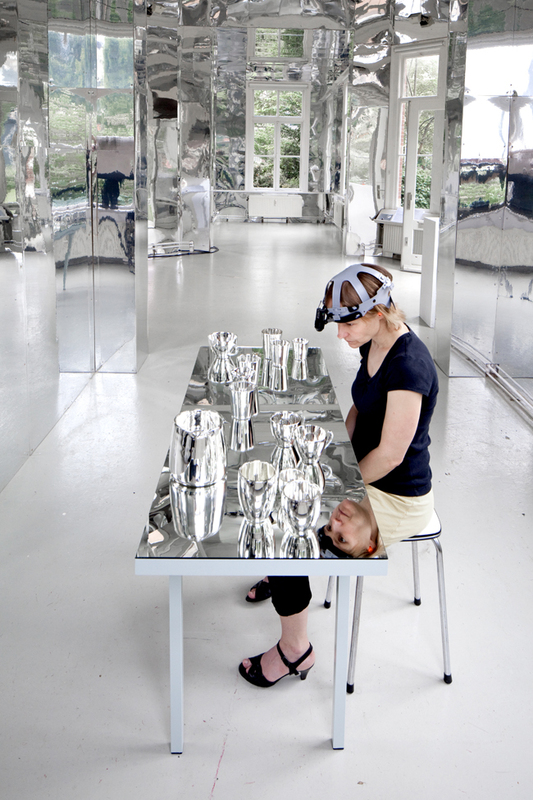 Going into the ratio of the mirror, object becoming a subject, the installation triggers the mirror neurons of the performer/participants that experiencing an infinite objectified space. Supper effect took place in the location of OutLINE gallery in Amsterdam, curated form Alice Smits. Is an artist born in Athens in 1977 and living in Amsterdam. In 2008, she formed 'reaction-lalou'. Her interest in cognitive science immersed by laws of physics, ontology and linguistics lead her to an exploration in the intermediary space of conscious and subconscious. 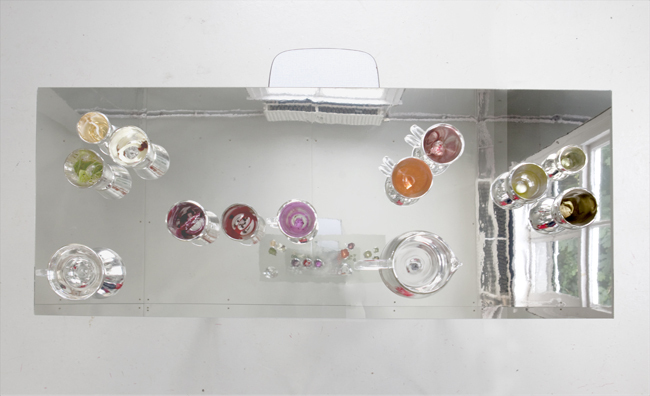 Lalou often works with the science of objects – containers, different types of cameras, spatial installations, accumulated performances and film. Lalou's specialization at glass science has been evolving in contextualizing aspects of mass / surface / space/ time /duration in the spheric of cognition by challenging the bodily experience questioning alignment of the vertical and horizontal, depth of space, disposition and disorientation; a performance within the politics of time. Lalou studied Interior Architecture, Constructive Arts in Technological Institute of Athens and product design with specialization in glass in Denmark's Designskole in Copenhagen, holding a Bsc. 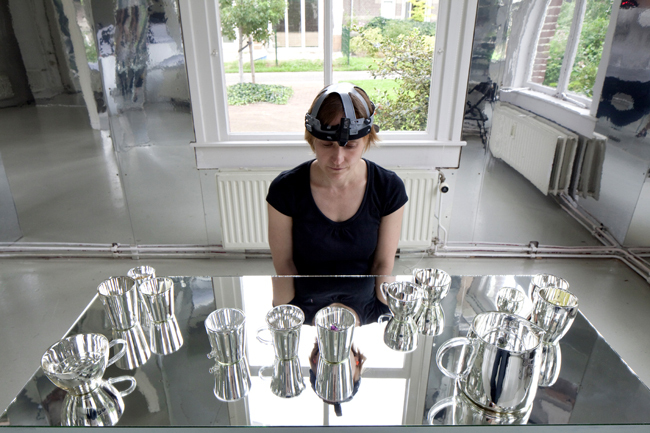 Graduating from Gerrit Rietveld Academie with BFA in Fine Arts/Glass , she has been collaborating with the artists Kaisu Koski (FI), Etienne de France(FR), Fernando Velazquez(UR/BR) Ronald Boer(NL), the composer Julia Carboneras (ES) and neuroscientist Raymond van EE (NL). 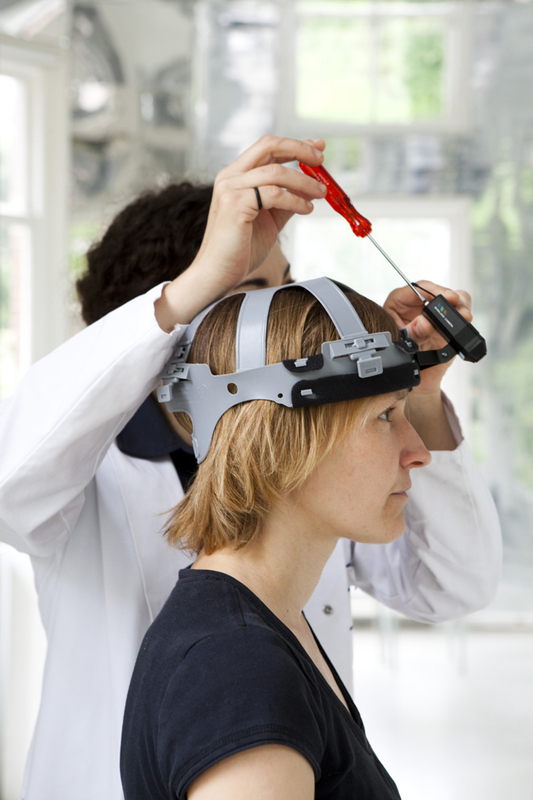 She has been signing works as 'Supper Effect'(2011) an interdisciplinary work which underlined her interest in Neuroscience. 'EEoME' (2010-...) an on-going documentary/archive with the destinations Athens, Damascus, Istanbul, Reykjavik and Amsterdam, questioning the performance role in public space and institutions within appointed and not appointed events. 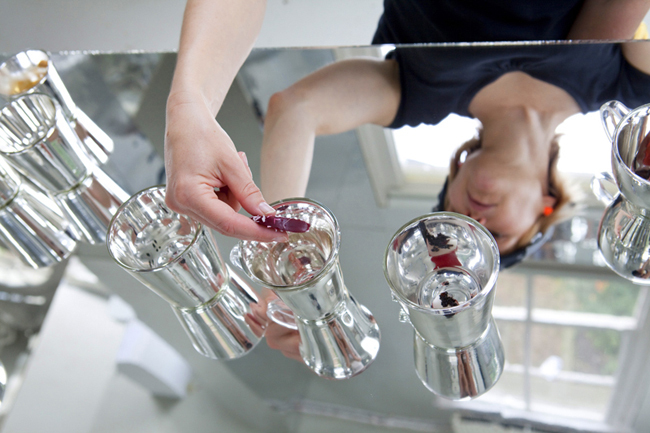 'Bubblescope' (2010) sculpture, made during her residency in the Lab of the National Museum of Glass in Netherlands. Oracle(2009) responsive environment with the one-off collective ' theggroup' exhibited amongst others in the 2nd Biennial of Thessaloniki and Manobra Festival in Brazil. Homoepathetic Medicine(2006) taking place in Beurs van Berlage former stock exchange of Amsterdam. At the moment she is researching the critical structures of theatre and the performativity borders, working on the perception of viewpoints. Developing a new work, the seminar/performance PUZZLE taking place in Athens - December 2012, and writing a fllmic/research work on the use of glasses.